At track meets across the country, anxious athletes can be seen walking around the infield, focusing on their upcoming event. These athletes pace around each other, mingling in the crowd of warmup suits and backpacks. In Coatesville, Pennsylvania, Desmond Marrow was just another face in that crowd. Marrow said his running career had a surprising start. “It all started in middle school, when I was cut from the team,” said Marrow, who is now a sophomore at Point Park. His early departure from his middle school team did not stop Marrow, however. Instead, he used this experience as an inspiration to keep going. 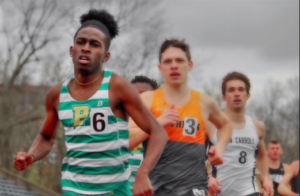 During his sophomore year of high school a bet amongst his friends encouraged him to join the track team to find out who would make the bigger impact on the track. “I was never the sports guy, but I found out that I was actually good at a sport,” Marrow said. Marrow kept on running at Coatesville Area High School. 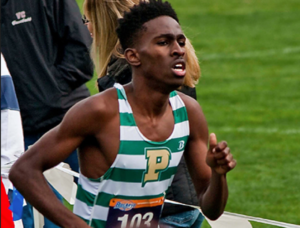 He specialized in the 800-meter run before graduating in 2015 and continuing his athletic career at Point Park University. As a freshman, Marrow helped the cross country team qualify for the National Association of Intercollegiate Athletic (NAIA) Championships and also qualified for the NAIA Championships during the indoor track season in the 600-meters with a personal-best time. But after a downfall cross country season that saw Point Park take sixth as a team in the River States Conference Championships (they were first the year before) and an indoor season where he failed to qualify for the national meet, Marrow says he began to go through a hard time in his collegiate experience. “I was going through depression. I was going through a different change. I guess you could say I missed home, and I just wasn’t where I was when I was running,” said Marrow. Marrow says the depression built up during his sophomore cross country season this past fall. A combination of homesickness and social distractions kept him from keeping his mind on school. Marrow did not drop out and return home. Instead, he used his frustration to push himself even more in his sport. “I went to go see a psychiatrist and just let it out on the track,” Marrow said. Using his ability to run competitively helped push Marrow. He says that the track was where he felt he was most accepted, where he could roam ceaselessly among the crowd of runners. “I wanted to let it out on my opponents,” he said. Marrow continued to better himself throughout the indoor track season, but still was not where he wanted to be as an emerging face in the River States Conference. Marrow said that socially, his mind was not in the right place. He says distractions kept him from performing to his potential on and off the track. Last season, Marrow was Point Park’s Track Team MVP, an award he wants to earn again with the support of his team. “We go through the same struggles here. We talk about it. We laugh about it. Sometimes we cry about it,” Marrow said. Marrow said he has been more open to his recent state of depression with his roommates and family. He says that most people have been coming to him, making sure he is doing better. 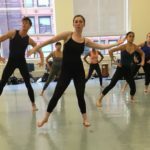 “After talking to some friends and psychiatrists, I learned that depression is something very serious and it should be taken seriously,” he said. His advice to people struggling with depression is that people should always talk. Whether it is talking with their friends, their coaches or even people they did not think would listen. He says being around people is also very important for the depressed person’s own safety. Individually, Marrow has his eyes set on the concurrent track season. Before many track races across the country, there are athletes seen anxiously awaiting their races. Then there is Desmond Marrow, quietly sitting under a steeple. His headphones were on as he listened to “Dear God” by Smokie Norful. His hood was over his head, patiently waiting for his time behind the start line. This piece is part of a project on Apocalyptic writing. It will be featured in a print magazine that will be presented at the 8th Annual Undergraduate Research Symposium on Friday, April 21, 2017 in the Center for Media Innovation on Point Park University’s campus.